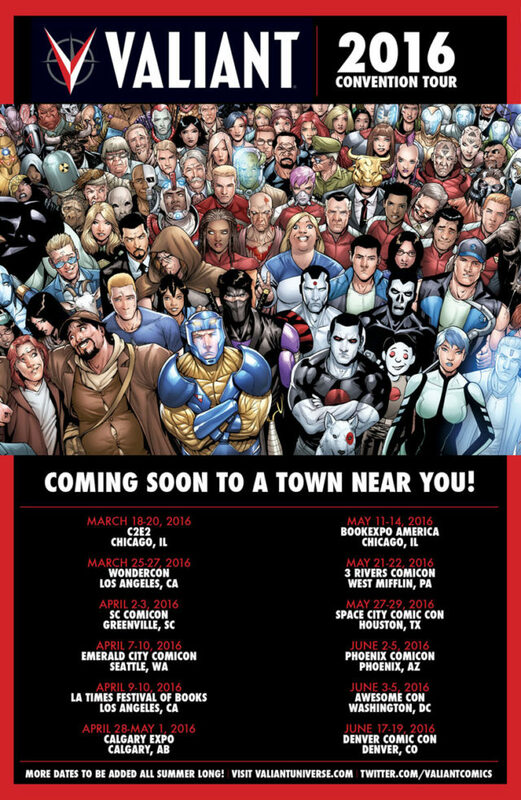 Valiant’s 2016 Convention Tour Adds 10 New Dates – Beginning at Emerald City Comicon 2016! This year, Valiant is taking the most critically acclaimed publishing line in comics on the road and gearing up to meet more than a million fans in the US and Canada throughout 2016! The year’s greatest celebration of your favorite superheroes takes flight in Seattle, WA at Emerald City Comicon 2016 (ECCC)! From Thursday, April 7th through Sunday, April 10th, join Valiant at the Washington State Convention Center for a weekend packed with programming, special guests, and ECCC exclusives that no fan will find anywhere else! Visit Booth #1702 all weekend long to find out why Valiant has captured the nation’s biggest headlines with a complete collection of trade paperbacks and hardcovers featuring Valiant’s world-class roster of superheroes and villains, including X-O MANOWAR, BLOODSHOT REBORN, NINJAK, BOOK OF DEATH, RAI, ARCHER & ARMSTRONG, THE DEATH-DEFYING DOCTOR MIRAGE, and more! 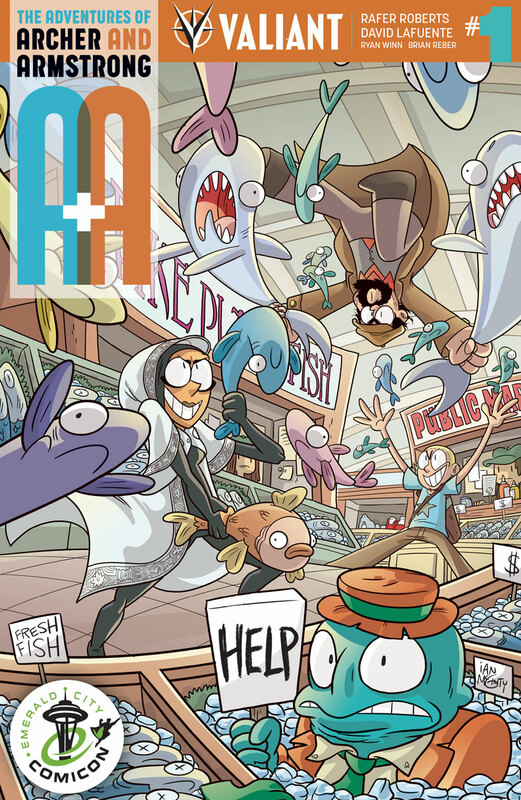 Come for the highest-proofed exclusive of the weekend with the A&A: THE ADVENTURES OF ARCHER & ARMSTRONG #1 ECCC EXCLUSIVE VARIANT – featuring the artwork of fan-favorite artist Ian McGinty (Adventure Time)! Red-hot writer Rafer Roberts (Plastic Farm) and superstar artist David Lafuente (Ultimate Spider-Man) kick off the FIRST ISSUE of Valiant’s next blockbuster series here with “IN THE BAG” – an insane rescue mission sending Archer into the depths of Armstrong’s bottomless satchel to free his roguish partner from an ages-old enemy…but only if he can fight his way through a mind-bending maze of history’s greatest lost treasures first! Then, meet the minds behind your favorite superhero sagas with signings throughout the weekend from an all-star cast of special guests, including superstar artist Clayton Crain (4001 A.D.), acclaimed artist Adam Gorham (DEAD DROP), breakout writer Jody Houser (FAITH), and New York Times best-selling writer Robert Venditti (X-O MANOWAR)! And get ready for the bottomless satchel’s worth of brand-new Valiant merchandise screaming into Seattle, including t-shirts featuring X-O MANOWAR, NINJAK, HARBINGER, FAITH, and ARCHER & ARMSTRONG, infant snapsuits, and more! But Valiant’s seismic plans are just warming up! On Saturday, April 9th at 12:15 PM in Room W3A, blast into Valiant’s most ambitious blockbuster event yet with Valiant: The Summer of 4001 A.D.! This summer…the future of Earth will be decided in the stars when Valiant presents the blockbuster crossover event of the year in 4001 A.D.! Now, get primed for the epic showdown between Rai and the forces of New Japan right here at Emerald City Comicon with an exclusive panel presentation from an all-star cast of Valiant staff and creators! Plus: don’t miss an all-new round of news and announcements for ARCHER & ARMSTRONG, BLOODSHOT REBORN, DIVINITY, FAITH, NINJAK, X-O MANOWAR, and more! As Valiant’s chart-topping place in comics climbs ever higher, the road to this year’s most exciting announcements, exclusives, and can’t-miss comics begins right here with one of the biggest shows of the year, only at Emerald City Comicon 2016! And look for new dates to be added to the Valiant 2016 Convention Tour all summer long!